What are jaw crusher prospect in Quarry crushing plant? NewsHome > News > What are jaw crusher prospect in Quarry crushing plant? Ecological Jaw Crusher technology not only promotes market development but also meets booming customer demand.As is well know, Environmental protection and energy saving concept are necessary new concept in development of various industries. Great Wall Company abides to the government policy and do continuous improvement on jaw crusher machine. Our jaw crushers are mainly divided into PE jaw crusher,PEC diesel engine jaw crusher and Mobile jaw crushing plant. Innovative Jaw crushers gain more market shares and have promising prospect in mining machinery industry. 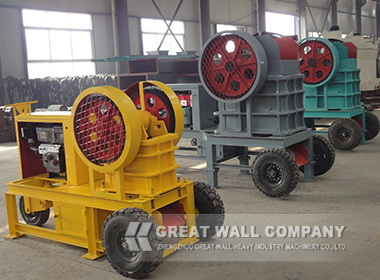 Great Wall innovative jaw crusher adopts the advanced technology and designs the environmental dust catching system. The reasonable quarry crushing plant makes full use of jaw crusher crushing capacity and reduce energy consumption. Jaw crusher plays more and more important role in the fields of mineral, construction, chemical, metallurgy and road. Mobile jaw crushing plant features of flexible displacement and optimized solution for recycling construction waste.If you are interested in jaw crusher machine or other stone crusher price, please feel free to contact with me. Previous: How to install jaw crusher for 300 TPH limestone crushing plant? Next: How to buy suitable Iron ore jaw crusher in crushing plant?